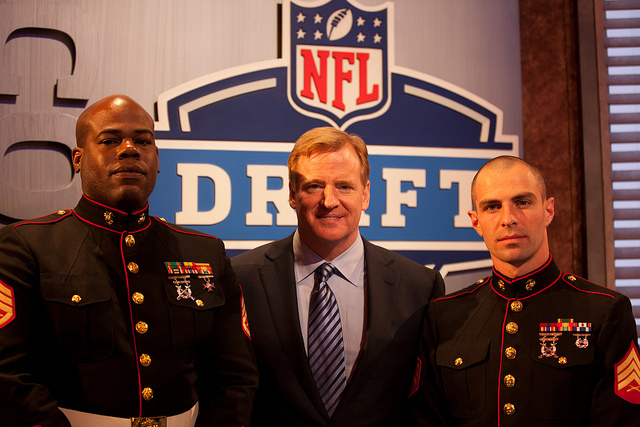 That, right there, is Roger Goodell, commissioner of the National Football League. The figurehead of the most popular American sport in the country, Goodell, who has been in charge since the 2006 NFL season, has worked with the league since 1984. He was also heavily involved in the last NFL lockout and is generally regarded as the reason it went so badly for the players, rather than the owners. All of this opens him up for what is an unending swell of criticism — like the ocean, it is always constant, even as it ebbs and flows. So when the NFL front office decided that it’d be a good idea to launch the #AskCommish questions, because clearly only good things can come from that. While the Commish only deigned to say he was ducking one question (“Would you rather fight 1 horse-sized duck OR 100 duck-sized horses?” Because, you know, puns. Get it? Ducking a duck question? Goodell’s a funny guy who says funny things, just like you.) There were many queries, both salient and silly, that he didn’t answer at all. So, while the Ginger Hammer — not an official nickname — didn’t officially respond to every tweet, they were still collected and searchable, and some of them were hilarious (and terribly mean). And because terribly mean things are great when leveled at those in positions of authority — especially when they’re in positions of authority regarding the NFL, which so often treats its players and fans like so many means to a giant fiscal end — here are the ten most hilarious responses to #AskCommish. 1. Some of them, like this tweet leveled at Goodell for his goofy mane. That’s a nice example of one that’s all in good fun. Some harmless ribbing at the expense of one powerful guy with the logo from a team that no one really expects great things out of year-in and year-out. That’s from one of BuzzFeed’s sports interns, a Brooklyn denizen who likes books, bikes, and comparing faces to NFL logos, apparently. 2. Or this one, from Kyle, a Bay Area sports fan who hates the 49ers. “Hi Roger- do you hate everything fun, or is it just fun things pertaining to the NFL?” While Ze Commish didn’t answer the question directly, one assumes that he knows that fun, as a subjective thing, cannot be a universal constant — as Goodell clearly takes great joy from toying with the fragile hearts of the NFL fanscape, that is certainly fun to him. It is not so fun for people like Kyle. 3. Then there’s the simply silly, like “can you ban Jerry Jones from the #NFL?” courtesy of (we presume) long-suffering Cowboys fan Cristian. No one really knows what authority Goodell has over banning owners from the league ala Adam Silver, but we assume that reading this kind of tweet and imagining the continued agony of Dallas fans is one of the things that The Ginger Hammer classifies as fun. 4. Then there are the harsh ones. Dexter’s Library, commenting on the league’s concussion crisis (which, let’s be clear here, is a subject that Goodell would prefer to snuff out with his own bare hands a la Showtime’s recently departed Dexter series) with some pretty bleak, understated humor. Luckily, even if the NFL front office wishes that these questions had never happened, the Internet saves them online for at least a little while. 5 and 6. Like the query from the Sports Pickle, who asked the Commish “Is me buying a $109.95 NFL ‘Salute to Service’ camouflage jersey or $37.95 hat the best way to support the military?” and CMCC, looking for some business advice, who asked, “I have a small business with about 300 employees. Any advice on busting their union?” Those were along the lines of the questions asking why the NFL doesn’t donate all of their profits from Breast Cancer Month merch (pink versions everything, essentially) to Breast Cancer research. All important questions. All unanswered. 8. What is Goodell trying to keep from us? What secrets is the Ginger Hammer privy to? Who is Keyzer Soze? While the Benghazi question is absurd, no doubt, it provides a great framing device for two other sportswriters who zeroed in on the latest NFL bit of information that can be safely classified as absolutely ridiculous.